Definitive Czechoslovakia stamps of 1929 to 1939 comprise three different categories. The categories are coat-of-arms, prominent Czechoslovakians, and castles and landmarks. 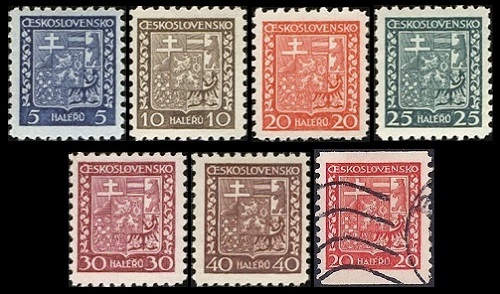 The seven low-denomination coat-of-arms type definitive Czechoslovakia stamps shown above were issued between 1929 and 1937. 05 H. (1931 - Sc. #152) - Dark Ultramarine. 10 H. (1931 - Sc. #153) - Bister Brown. 20 H. (1929 - Sc. #154) - Red. 25 H. (1929 - Sc. #155) - Green. 30 H. (1929 - Sc. #156) - Red Violet. 40 H. (1929 - Sc. #157a) - Red Brown. 40 H. (1937 - Sc. #157) - Dark Brown. 20 H. (1929 - Sc. #158) - Red. The four high-denomination castle and landmark type definitive Czechoslovakia stamps shown above were issued between 1929 and 1931. 03 K. (1929 - Sc. #165) - Brno Cathedral. The Cathedral of Saints Peter and Paul, in Brno, is a national cultural monument. The Baroque cathedral was begun in the 14th Century, on the site of a former Gothic basilica. 04 K. (1929 - Sc. #166) - Tatra Mountains scene. The Tatra Mountains form a natural border between Slovakia and Poland. 05 K. (1929 - Sc. #167) - Old City Square in Prague. The historic square in the Old Town of Prague is dominated by the 14th Century Gothic Church of Our Lady before Tyn, and it is the site of the execution of Jan Hus. 10 K. (1931 - Sc. #183) - St. Nicholas Church in Prague. The Baroque church in Prague was built between 1704 and 1755, on the site of a 13th Century Gothic church of the same name. The three higher-denomination prominent Czechoslovakians type definitive Czechoslovakia stamps shown above were issued between 1930 and 1931. 50 H. (1930 - Sc. #168) - President Thomas Masaryk. 60 H. (1930 - Sc. #169) - President Thomas Masaryk. 01 K. (1930 - Sc. #170) - President Thomas Masaryk. 01 K. (1931 - Sc. #171) - President Thomas Masaryk. The three high-denomination castle and landmark type definitive Czechoslovakia stamps shown above were issued on January 2, 1932. 3.50 K. (1932 - Sc. #184) - Krivoklat Castle. This central Bohemian castle was founded in the 12th Century. 4.00 K. (1932 - Sc. #185) - Orlik Castle. This southern Bohemian Castle was founded in the 13th Century. 5.00 K. (1932 - Sc. #186) - Krumlov Castle. This Baroque castle was a private residence, until 1947, when it became a Czechoslovakian national monument. 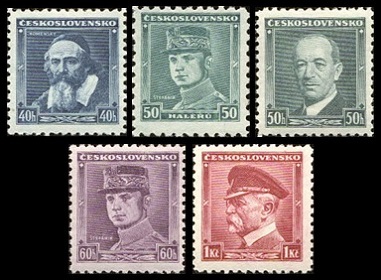 The five higher-denomination prominent Czechoslovakians type definitive Czechoslovakia stamps shown above were issued between 1935 and 1936. 50 H. (1930 - CESKOSLOVENSKO - Sc. #208) - General Milan Stefanik. 40 H. (1936 - CESKOSLOVENSKO - Sc. #215) - Jan Amos Comenius. 50 H. (1936 - CESKOSLOVENSKO - Sc. #216) - President Edvard Benes. 60 H. (1936 - CESKOSLOVENSKO - Sc. #217) - General Milan Stefanik. 01 K. (1935 - CESKOSLOVENSKO - Sc. #212) - President Thomas Masaryk. 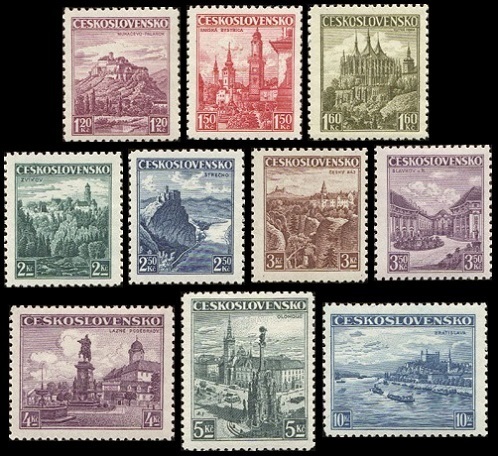 The ten high-denomination castle and landmark type definitive Czechoslovakia stamps shown above were issued between 1936 and 1937. 01.20 K. (1936 - Sc. #218) - Krivoklat Castle. The central Bohemian castle was founded by the Kings of Bohemia in the 12th Century. 01.50 K. (1936 - Sc. #219) - Town of Banska Bystrica. The central Slovakian town was founded by German settlers in the 13th Century, though it was built on the site of a former Slavic settlement. 01.60 K. (1937 - Sc. #240) - St. Barbara's Church in Kutna Hora. This Gothic cathedral in central Bohemia was begun in 1388. It is one of the most famous churches in central Europe, and it is a UNESCO World Heritage Site. 02.00 K. (1936 - Sc. #220) - Zvikov Castle. The southern Bohemian castle was founded by the Kings of Bohemia in the early part of the 13th Century. It has been said that the castle is haunted. 02.50 K. (1936 - Sc. #221) - Strecno Castle. The northern Slovakian castle was originally constructed during the 14th Century. Today it is a national cultural heritage site of the Republic of Slovakia. 03.00 K. (1936 - Sc. #222) - Trosky Castle. The ruins of this 14th Century Bohemian castle are located in the Cesky Raj Region. 03.50 K. (1936 - Sc. #223) - Slavkov Palace (Austerlitz). The castle was built by Teutonic Knights in the 12th Century, and then again by a Moravian noble family in the 16th Century. The castle and its surrounding area is where the famous Battle of Austerlitz was fought in 1805. 04.00 K. (1936 - Sc. #224) - Statue of King George at Podebrad. George of Kunstat and Podebrad was the King of Bohemia from 1458 to 1471. 05.00 K. (1936 - Sc. #225) - Town Square in Olomouc. The settlement of Olomouc dates back to the 2nd Century. At times the prosperous city has competed against Brun for the Capitol of Moravia. Officially founded in the 10th Century, it is best known for its magnificent churches, constructed between the 12th and 15th Centuries. 10.00 K. (1936 - Sc. #226) - Castle Ruins at Bratislava. The Slovakian castle was founded in the 9th Century, though its completion, ruin, and restoration would continue for over a thousand years! The four higher-denomination prominent Czechoslovakians type definitive Czechoslovakia stamps shown above were issued between 1937 and 1939. 50 H. (1937 - CESKOSLOVENSKO - Sc. #227) - President Edvard Benes. 50 H. (1938 - CESKOSLOVENSKO - Sc. #252) - General Milan Stefanik. 60 H. (1939 - CESKOSLOVENSKO - Sc. #255) - General Milan Stefanik. 01 K. (1939 - CESKO-SLOVENSKO - Sc. #256) - President Thomas Masaryk. The 60 H. denomination was used exclusively in Slovakia. From 1939 to 1945, Czechoslovakia was partitioned into the Nazi German controlled state of Bohemia and Moravia and the Nazi German controlled state of Slovakia. No further Republic of Czechoslovakia postage stamps were issued. A Czechoslovakian government-in-exile, recognized as the legal continuation of the First Republic of Czechoslovakia, operated initially in France, and then in Great Britain, until the end of World War II. Milan Rastislav Stefanik (1880-1919) was a Slovakian politician, diplomat, and astronomer. 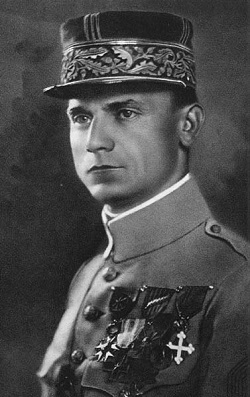 During World War I, he served as a General in the French Army, and later, as the Czechoslovakian Minister of War. While in Paris, in 1915, he met with Edvard Benes and Thomas Masaryk. The three of them were instrumental in creating the Czechoslovak National Council, which would became the provisional government of Czechoslovakia at the end of World War I. On May 4, 1919, Stefanik was returning home to Bratislava from Udine, Italy, onboard an Italian military plane. The plane crashed outside of Bratislava, and everyone onboard was killed. Jan Amos Comenius or Komensky (1592-1670) was a Czech philosopher, educator, writer, and theologian from the Margraviate of Moravia. He was one of the earliest champions of universal education. He first introduced pictorial textbooks, written in native languages, instead of Latin. He also supported the idea of equal opportunity for impoverished children, and he supported education for women. 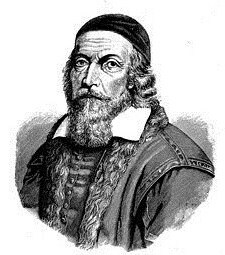 Comenius also lived and worked in Sweden, the Polish Lithuanian Commonwealth, Transylvania, England, the Netherlands, and Hungary. Today, he is considered the father of modern education. Edvard Benes (1884-1948), born in Bohemia, was a Czech politician and diplomat. 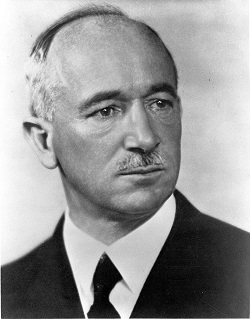 In addition to his other government posts, Edvard Benes served as the President of Czechoslovakia TWICE, once from 1935-1938, and again from 1945-1948. Benes suffered two strokes in 1947 and died peacefully on September 3, 1948.